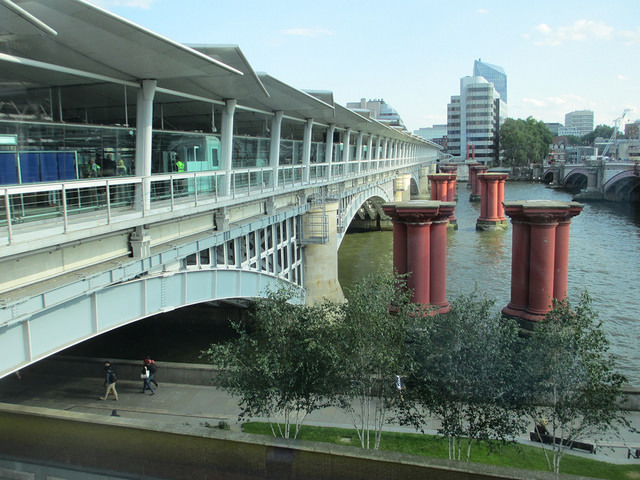 View from Blackfriars Station over the revamped rail bridge. Following its recent revamp, Blackfriars has become the only station to span the Thames, with entrances on both banks. It's named for a priory of the Dominican order, established at the foot of Ludgate Hill in 1276. Dominican friars traditionally wore black garments, and hence their hangout became known as Black Freres (black brothers) and later Blackfriars. This is the only mainline station to get its name from an article of clothing. 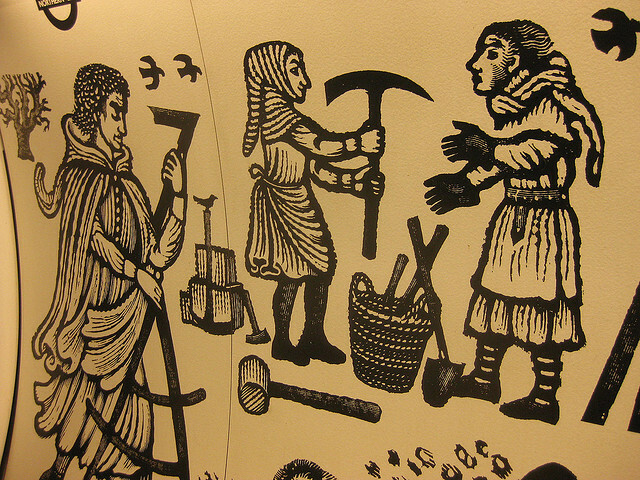 Medieval stonemasons working on the Eleanor Cross, as depicted by David Gentleman. A name of two halves. For the Charing bit, look to the river. It comes to us from the Old English word 'cierring', which means 'turning' — a likely reference to the sharp bend in the Thames at this point. The Cross relates to the final Eleanor Cross, a series of monuments marking the nightly resting places of the eponymous queen's body, following her death near Lincoln in 1290. The original London memorials have long vanished, but a Victorian pastiche can still be seen in the taxi rank of the station. Further references can be found in David Gentleman's wonderful murals down on the Northern Line platforms. Easy one. The station was built on land owned by the Dukes of Grafton, whose ancestral home is Euston Hall in Suffolk, situated near the village of Euston. The village name was first recorded in Domesday Book, suggesting an Anglo-Saxon origin, and perhaps deriving from "Efe's Tun", a farmstead belonging to a person called Efe. Nobody is certain of the derivation of this name. The simple explanation — a church on marshy 'fen' land — is quoted by some. However, it's more commonly believed that the fen derives from faenum, Latin for hay. A hay market is known to have operated on the site in earlier centuries. The 'church' part of the name probably relates to St Gabriel Fenchurch. This stood on the site where Plantation Place can be found today (there's a glazed blue plaque to say so). The church burnt down in the Great Fire. 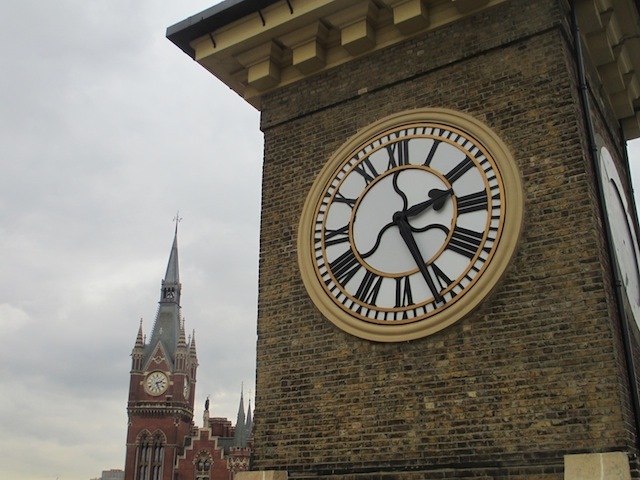 King's Cross clock tower with St Pancras in the background. This one's well documented. The area was originally called Battle Bridge, but gradually became known by its modern name following the installation of a monument to George IV in 1830. The monument was unpopular and lasted just 15 years, yet its name endured. Controversy still rages (and it really does rage), in respect to apostrophe usage. The station dates back to 1864 and takes its name from the local road. This itself was only named in 1827, in honour of Prime Minister Lord Liverpool. If we trace further back, the PM's title obviously comes from the city of Liverpool. This was first recorded in 1190 as Liuerpul, which probably means a pool or creek of muddy water. Hence, this station is the only London terminus to be named after a scouse bog. London Bridge station, currently undergoing major works. No medals for guessing how this station next to London Bridge got its name. It does, however, bear the distinction of being the capital's oldest central terminus, opened on 14 December 1836. The area was long known as Tyburn, after a small river whose course can still be readily made out from the wiggly route of Marylebone Lane on a street map. A name change occurred sometime before 1453, when Maryburne is first recorded. One explanation for this early example of rebranding is an attempt to dissociate the lands with the notorious Tyburn gallows (close to today's Marble Arch). 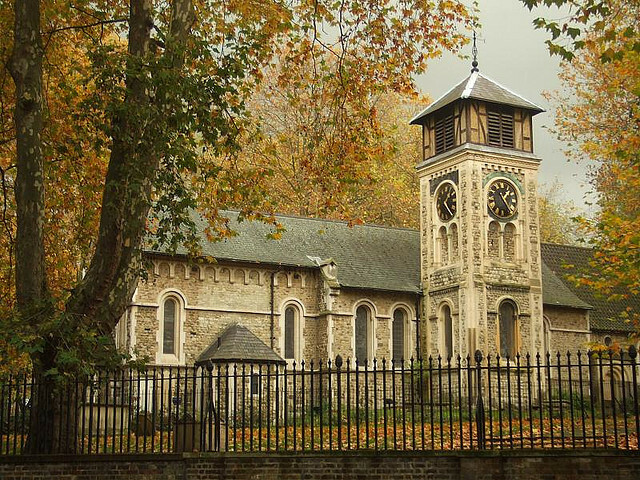 Over time, Maryburne became Marylebone, which refers to the church of St Mary on the banks of the bourne (an old name for river). The church is still there, and so is the river — now covered and used as a sewer. If you go for a wazz in John Lewis, you're probably contributing to the Tyburn. Perhaps not so well-known as a terminus, Moorgate is the final stop for the Northern City Line — a route with characteristics of both the Underground (of which it used to be part) and a mainline service. Moorgate takes its name from a nearby portal in the medieval city walls, built in the 15th century on the site of a Roman postern. The 'moor' half of the name relates to Moorfields, formerly a large open space outside the walls — a boggy moor until it was drained in the early 16th century. The marshy character was thought to be partly a result of the city wall obstructing the flow of the River Walbrook. Named after an immigrant bear with a proclivity for duffle coats. Or was it the other way around? Actually, the west-facing station and the wider area carry a name from Anglo-Saxon times, probably after a local land-owner called Padda (the exact name is uncertain), with 'ton' or 'tun' meaning 'the village of'. Ye olde site of Christian worship. The international part is fairly obvious, given that this is the London home of Eurostar services to the continent. But who was this St Pancras? London's most magnificent station and the surrounding area take their name from a Roman teenager, who was beheaded for converting to Christianity at a time when this was outlawed (c. 304 AD). Young master Pancras had probably never even heard of Londinium, and it's unclear exactly why the founders of the first church on the site should choose him as their dedicatee. It may be that Pancratic relics found their way to the region, or perhaps his memory was promoted by members of a nearby Roman camp, established at a date when Christianity was more widespread within the Roman Empire. Either way, this is thought to be one of the most ancient sites of Christian worship in the country. The name has nothing to do with abdominal glandular organs. Named after nearby Victoria Street which, like so many things in London, honours the long-lived queen. The street opened in 1851, with a formal procession from the Abbey to the site of the future station. Its construction cut through a notorious slum district, displacing hundreds of London's poorest people to seek shelter elsewhere. One dignitary at the celebratory meal toasted the improvement of an area "formerly infested with the worst holes of filthiness and impurity". The rail station opened to the public in 1848, when the area was already known as Waterloo. The nearby bridge was under construction at the time of the battle (1815). It was to have been called Strand Bridge, but the military victory immediately prompted calls for a 'Bridge of Waterloo'. The span opened two years later as the slightly snappier Waterloo Bridge, begetting Waterloo Road, the name of the wider area and — three decades later — the station. Pedants' note: the definition of a terminus is slippery. 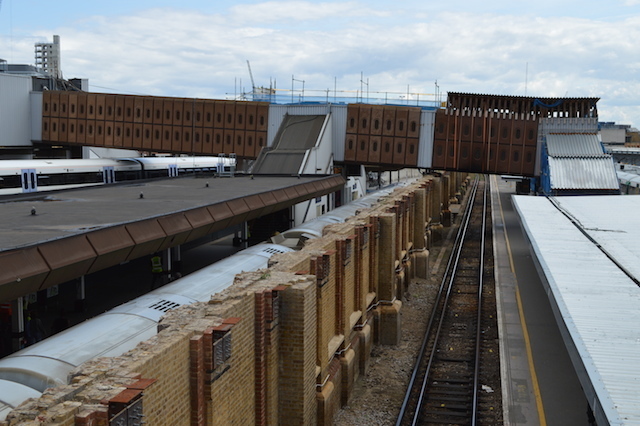 London Bridge, for example, is a through-station as well as a terminus. Ditto Blackfriars. Meanwhile, we might have included other busy interchanges like Clapham Junction or other members of the London Station Group like Old Street. But where to draw the line? The final selection is therefore somewhat whimsical, based on stations that 'feel like' the important mainline termini.